I begin my KonMari method experience by tackling all the clothing in my house. Marie Kondo recommends beginning by sorting out clothing as there is less of an emotional connection to it. I have seen different sorts of checklists floating around online, but today I will share with you the method that I have used to sort out all of the clothing in my home, and what falls under the clothing category. You must begin by gathering every item of clothing in your home. Everything. It was actually quite fun to just chuck all of the clothing from the wardrobes and drawers into a massive pile on the living room floor. But don’t think that the clothing category is confined only to clothing. It also includes hats, underwear, seasonal wear, coats, and even handbags. The simplest way for me was this – if you can wear it consider it clothing. Some people may find tidying up more enjoyable than others. I fall in the former category. If you are reading this post you may be at a point where liking it or not doesn’t matter and you just need to get it done. That’s perfectly acceptable as well, but you do need to focus on whether or not the individual item sparks joy. 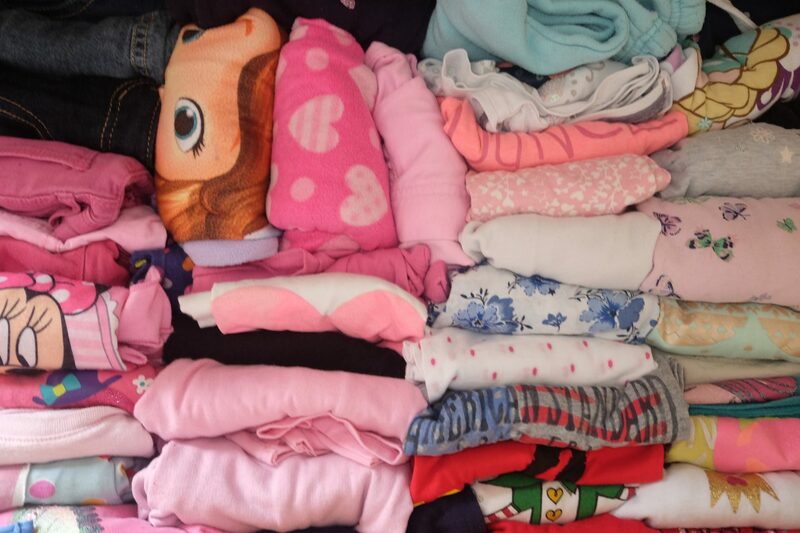 Once all of your items are gathered you can randomly pick up any item, but I’ve opted to sub-categorise and began with what I thought was easier and more manageable which was the children’s clothing. The process begins by holding each item in your hands and asking yourself, “does it spark joy”? If the item sparks joy then set it aside in a keep pile. When the answer is no, an item doesn’t spark joy, the next step is to decide what to do with it. If the item has life left in it then set aside a donation pile, if it doesn’t (which I find is rarely the case) the next step is to put it in the rubbish bin. My personal way of doing things was so sit on the floor with a couple of black liner bin bags and basket or clothing hamper. The latter was where I put all of the items that I was keeping and needed to store. If the items were to be donated or thrown in the bin then in their own respective bags they went. Before you do any discarding, whether it be in the rubbish pile or the donate pile you must thank your items for the service they have provided. Hold your item in your hands for a few seconds and give it it’s final farewell. Tip #1 – Discard before you store. This part can be a bit tricky. 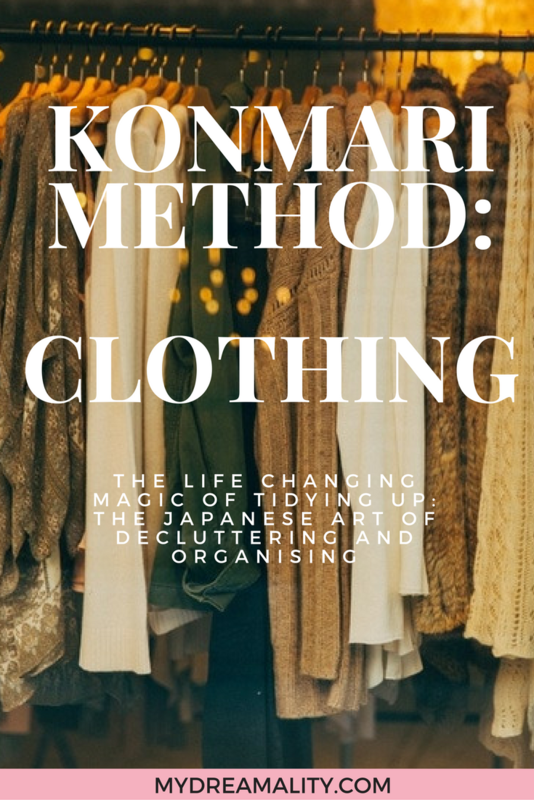 You may think that once you have discarded what you don’t want or need then you go back to storing your items the way you’ve always known how, however, this isn’t what KonMari recommends. There are few things that make the KonMari approach different, one of them is the way she stores clothing. To follow the KonMari method one word you must remember is vertical. Hanging your items has always been my preference. It’s just always made more sense to me for my clothing to be hanging in a closet. Marie Kondo quite prefers the concept of your clothing being folded. One might think that it leads to wrinkles, but her method even includes a distinct way of folding and storing folded clothing which you can see first hand by watching this video. Just because the KonMari method recommends folding your clothes this doesn’t mean that you can’t hang any clothes up. There are clothing items that are just “happier” when they are hanging – such as dresses, certain knits, coats, etc. The method advocates that your longer and heavier pieces of clothing be hanging on the left side and lighter, shorter items on the right. This makes the eye travel from left to right and is said to create a more joyful outlook when you look at your garments. One very simple way to ensure that your handbags don’t take up too much space, and that they don’t lose their shape is to store them within each other. This is extremely simple and both effective for the shape and life of your bags, as well as ensuring that your bags don’t take up too much space. Begin by setting out all your bags with the smallest on the left. As you go right the size should increase. Once they are laid out simply move from left to right and store the bag on the left inside the bag on the right. Tip #2 – I also do this for my makeup bags and it’s made keeping track of them so much easier. This part of the method can be a bit time consuming, but with a little bit of effort I have noticed that the items of clothing that I see now are ones that genuinely make me happy to see and wear. The next post will be all about one thing that I’ve been guilty of having too many of – BOOKS! Bonus tip: Drawer dividers may be for sale at all sorts of brick and mortar as well as online shops. Ditch the expense and use shoe boxes to help organise your drawers. Previous Post Beauty Debate: Is Cosmetic Surgery Always A Bad Thing?